that our brains process 70% of what we see, but only 30% of what we read or hear? that 68% of all purchase decisions are unplanned? that an average supermarket (not including the major discounters) offers somewhere between 15,000 and 30,000 products? that our brain will automatically and immediately focus on unexpected form and colours (pop-out effect)? that the willingness to spend, increases when shoppers hold a product for longer than thirty seconds? that changing the purchase environment results in more sales? that shoppers prefer products they have seen more often (mere exposure effect)? Limit the use of text. Text that explains what the image already says is superfluous and counterproductive. Place text as much as possible to the right; the shopper's brain will digest the message faster. Information in colour gets read better, up to 40 percent. Colour also speeds up information transfer by more than 50%. Colour is one of the fastest ways of communicating, without having to express a single word. Red for example speaks of urgency, orange prompts action, blue and brown come across as reliable, and extremely bright colours demand attention; however they tend not to make people linger for long. Keep it simple and direct, there is little time! A shopper will decide within 3 to 8 seconds whether he or she is interested in a product. Our 'mirror' hormones induce us to copy behaviour. So if possible always show people being happy with what the product does for them. And choose people who look directly at the shopper, as the brain automatically and immediately reacts to this. Avoid placing a logo too close to images of people, as shoppers will pay more attention to the people than the logo. Products in the bottom right corner are experienced as heavy, products placed in the top left corner as light. A partially empty display is no bad thing. Fear of a product becoming scarce can incite a purchase. Load up a display right to the bottom. A shopper who has to bend over to reach the product is actively engaging with the product, which improves the product's brain position. Too many different products or too many varieties of the same products in a single display can induce selection stress, often resulting in the shopper buying nothing at all. Due to increasing restrictions on dimensions during transport, displays will often need to be erected using an unnecessary high number of components. 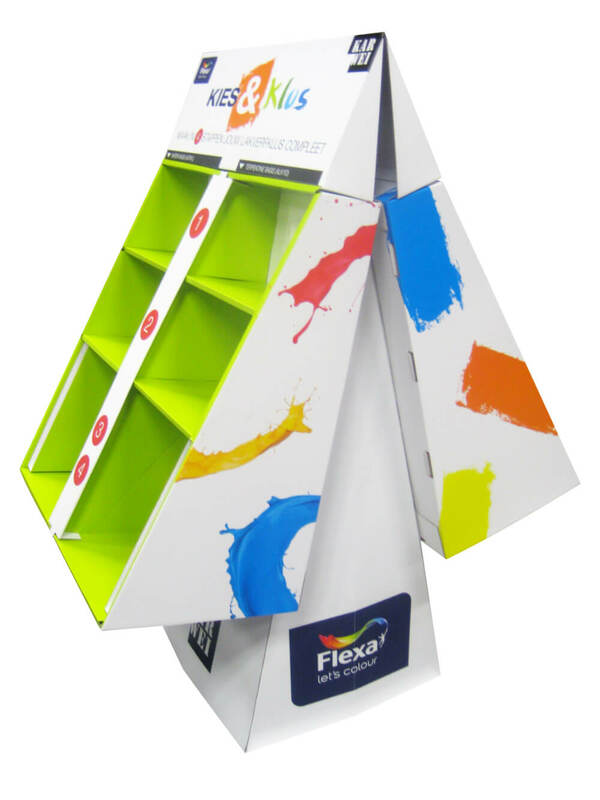 This may save on transport costs, but it can result in displays too complex to erect, which then just end up in the retailer's bin. The costs involved in creating the display are lost and, worse still, no extra sales are generated. It may therefore be to your advantage to accept a little bit more on transport costs.